The NFL needs goal line technology worse than FIFA, Sports Techie. As much as I love the NFL, they must be called out for not having goal line technology in place at a bare minimum in order to assist the officials in getting touchdown calls correct. Yes, the argument that if you implement it at the goal line then you have to have it in place for the first down line is valid, and I totally agree. It’s like MLB bringing in instant replay only to restrict it to home run calls and not apply it to obviously blown calls that could be reversed if a better technological Solution was in place. Get this straight Sports Techie, money is zero factor. We are taking about billion dollar sportsbiz in a game of inches. The NFL can afford to build a state of the art and warm stadium in Antarctica and host a sold out Super Bowl there if they wanted to so they can certainly afford any necessary tech upgrade costs. For me, it goes back to the phantom touchdown scored by New York Jets quarterback Vinny Testaverde in 1998 that caused the defeat of the Seattle Seahawks whom I was working for maintaining and supporting the GridIron 2000 Expert football System. Many NFL fans feel that this play was the final straw that caused the NFL to bring back instant replay for good. Review this ST blog – MLB There Can Be Only One FIFA: https://sportstechie.net/mlb-there-can-be-only-one-fifa/. OK ST, fast forward to January 6, 2007, the day I was at Century Link stadium with fellow Spiritof12 when Dallas Cowboys QB Tony Romo flubbed the extra point kick attempt allowing the Seattle Seahawks to win that playoff game and eventually make it to their first Super Bowl appearance. What most fans do not remember was that an official almost blew it the play before the blotched kick play on a horrible spot of the ball. Via ESPN GameHQ: “He moved the Cowboys from their 28 to the Seattle 2, where a pass to Jason Whitten was initially ruled a first down before a replay showed the Cowboys were short.” http://scores.espn.go.com/nfl/recap?gameId=270106026. And now this past weekend, it continued. The call that was obvious all the way up here in Seattle was when Wes Welker of the New England Patriots athletically reaching the football over the goal lines corner pylon as he flew out of bounds in their game against Dallas. If you get to see a replay, watch the official’s eye as he stands two feet from the play and notice that he is not watching the ball. Fortunately, instant replay was in place and his bad call was overturned by a competent booth official. Then there was the end of the emotional and explosive game between the Detroit Lions and San Francisco 49er’s. This was the game where both head coaches got into a shoving match during the post game handshake. On the last play from scrimmage for the 49er’s, they scored what turned out to be the winning touchdown as Delanie Walker fell over the goal line while being tackled, or so it seemed. Watch this video from DLionsOfficial on Youtube and pay attention to the 3:00 minute mark: http://www.youtube.com/watch?v=chN7qo5Dr2E. Every instant replay angle showed basically the same thing, it was too hard to positively call it a score with the human eye. Now if the NFL had goal line tech in place there would have been no question as to whether or not it really was a TD. Bravo to the NFL for using instant replay, but why stop there? Sports Techie has seen how well the Hawkeye tech in tennis works. 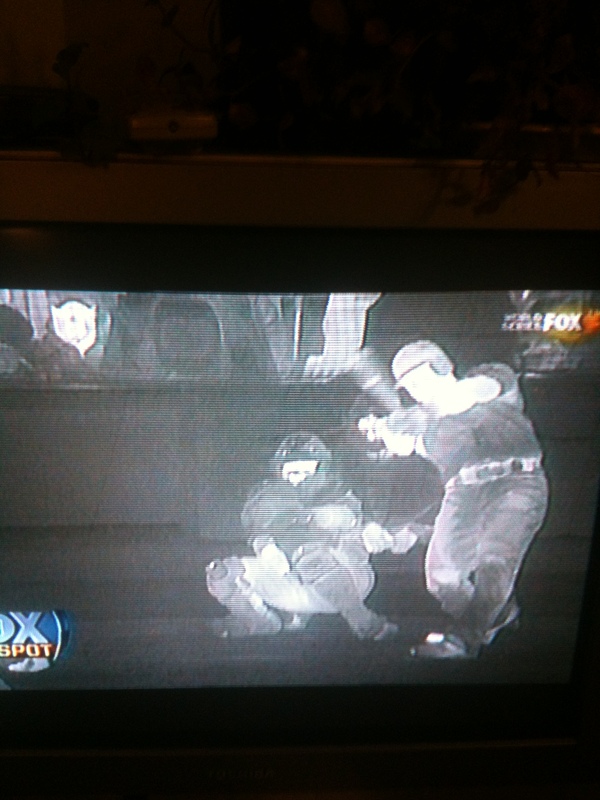 If you watched the 2011 World Series last night, Fox Sports unveiled a new infrared picture that ended up highlighting the 9th inning blown call by the home plate umpire on a foul ball that actually did hit the batters shoe upon further review. See the picture above and check out the white spot on the Rangers hitter shoe, it’s the baseball. Here are a few concepts about how RFID technology could work at the goal line: http://www.rfidnews.org/2010/08/06/nfl-debates-use-of-goal-line-technology and http://www.youtube.com/watch?v=_WkQVknzJtU. My point is: why is some sort of tech not in place at the goal line yet, NFL? My educated ST guess is that it is not too hard to design and implement, especially, if you want it Commish. The NFL needs goal line technology worse than FIFA (and MLB), right Sports Techie. Leave your comments below.